Offers Spanish tapas cuisine in an relaxed environment with intimate and stylish interiors. Iberico world tapas brings together the rustic simplicity of Spanish tapas together with the refined ingredients of world cooking all presented to you in a stylish and intimate vaulted restaurant. Located in the heart of the Nottingham Lace market, in the historic Galleries of Justice, the grade 2 listed building offers a great relaxed dining atmosphere with a cosmopolitan interior. Award winning fine dining indian restaurant. 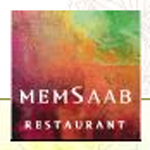 Runner up restaurant of the year 2009, winner for best Indian cuisines in 2008, 2007, and 2006. Through experience, development, and true love for authentic Indian cuisine, Naj Aziz has succeeded in creating an Indian fine dining experience that keeps MemSaab - true to her name - in a class of her own. Accentuating the colonial ambience of the restaurant and lounge bar, the furnishings include individually made items of furniture and various unusual artefacts from around the globe. Modern, sophisticated restaurant adorned with authentic Thai art and water features throughout. Offers exquisite Thai cuisine prepared to the highest standards by experienced Thai chefs. Tarn Thai opened in the summer of 2006 to rave reviews and has already secured a strong following from diners. The reason for our growing success is simple and is directly related to our philosophy which is: exquisite dining, excellent service and beautiful surroundings. Family-run and Michelin rated restaurant which offers traditional English cuisine. The first floor private dining room is available for parties, functions and business conferences 7 days a week. Choose from breakfast, lunch and dinner dining packages or design a bespoke menu to suit you with our chefs. We also offer simple delegate rates (tea, coffee, light refreshments) for daytime meetings. See our MENUS section for the current menu. Offers a range of cuisine that draws upon the delicate flavors of China, South East Asia and modern Japan. The award winning Chino Latino brings a sophisticated and elegant dining experience to Nottingham’s city centre. Food is served to share and dishes are brought steadily to the table creating an informal yet sophisticated style of eating and drinking- the best way to enjoy the taste sensation that is Chino Latino.